The European Commission is getting ready to feed money into transport projects around Europe and will focus its attention on large infrastructure and technology for traffic management. Critics of the Commission’s new round of investment say it’s leaving behind small transport infrastructure that sorely needs public funding. A total of €7.56 billion in grants will be shelled out from the Commission’s Connecting Europe Facility, a fund worth a total of €30 billion, with €24 billion dedicated to transport infrastructure. The executive started accepting applications today (6 November) for the programme’s second funding round and will review proposals early next year with a payout slated for September 2016. Most of the money—€6.47 billion—will go to member states that receive cohesion funds: Slovenia, Greece, Slovakia, Poland, Romania, Hungary, Latvia, Bulgaria, Croatia, Cyprus, the Czech Republic, Estonia, Lithuania, Malta and Portugal. 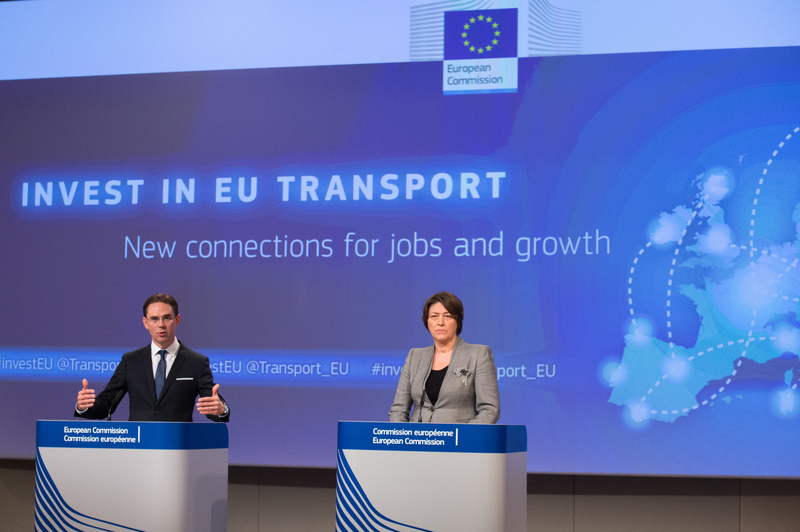 Transport Commissioner Violeta Bulc said yesterday that the funds will target large infrastructure and are supposed to pitch in to meet the Commission’s digital single market goals by financing tech-heavy projects. Digital transport features set to rake in some of the funds include intelligent transport systems that the Commission hopes will cut traffic congestion and fuel use. The Commission is leaning heavily on its Single European Sky programme to reform air traffic management in the new funding round. Projects submitted under that heading are set to receive more money than any other targeted type of infrastructure—€515 million for all member states. and €300 million for those receiving cohesion funds. Member states have dragged their feet on implementing Single European Sky, which has been in the works for a decade. European Commission Vice-President Jyrki Katainen and Transport Commissioner Violeta Bulc said during a press conference yesterday that the Connecting Europe Facility grants can be combined with loans from the European Investment Bank or the bank’s European Fund for Strategic Investment (EFSI) and aim to leverage matching private investment. Projects that are already well developed, likely to attract private money and in high-traffic areas will have priority for the grants. “I hope the member states will embrace this opportunity and come up with really sound and mature projects,” Bulc said. A whopping total of €5 billion, the biggest chunk of the new transport funds, will go towards building infrastructure in the nine ‘corridors,’ regional networks around Europe that the Commission wants to carve out using a mixture of different transport modes. Funds are still lacking for parts of those networks in several member states that receive cohesion funds, including Slovakia, Slovenia and Poland. MEPs already approved the executive’s plans to disperse money for cross-border transport lines; regional governments have also signalled their support. But some critics argue that the Commission’s focus on large infrastructure won’t fill in transport gaps in smaller communities, where investment is sparse and less likely to be taken up by private companies. German MEP Michael Cramer (Greens), chair of the European Parliament’s Transport Committee, has called for the Commission to direct funds to small transport projects—including from the €315 billion Juncker Plan. “Let’s be smart and put the rehabilitation of small cross-border rail sections before the construction of new large-scale projects,” Cramer said of the European Commission’s newest call for proposals. Member states receiving cohesion funds will have access to the €200 million dedicated to ERTMS, a major overhaul that will replace Europe’s national train control systems with one cross-border standard. The same amount will be available separately to all EU member states. While ERTMS is better funded than several other programmes set out in the Commission’s plan, it will receive less than half the money dedicated to Single European Sky projects. Officials from DG MOVE will present its blueprint for the second funding round on Monday (9 November) in a Transport Committee meeting in Parliament. But sources in the executive insist that the Connecting Europe Facility money isn’t fit for small-scale projects and would get in the way of building the nine large, high speed corridor routes by its 2030 deadline. By filling in missing parts of major transport routes, Commission officials say travel will be eased between economic centres—cities, ports and other transport hubs—and leave smaller routes to be tackled by other funding programmes. After a dispute between the European Commission and Parliament earlier this year, recent cuts to the Connecting Europe Facility funds were limited to €200 million. The Commission had originally planned to shave off more from the programme to finance the Juncker Plan. The Connecting Europe Facility (CEF) will see almost €30 billion in public money targeted at enhancing the EU's transport, energy and telecoms networks. €30 billion of the fund will go towards transport infrastructure. The European Commission is focusing on large-scale projects, particularly in its nine corridor networks, and on technology-driven infrastructure. A first funding round was launched last year and targeted energy. Transport projects will be evaluated for funding as part of the second round early next year. Another scheme to transfer capital from the havs to the have nots. We have to go out & raise money to fund our own infrastructure investments & then go out & raise more money to fund other countries infrastructure improvements so they can avoid hard decisions that impact on their chances of being re-elected.